If you'd like to use whole wheat pastry flour or sprouted whole wheat flour instead of spelt, use an additional 1/4 cup of flour. Combine flour and coconut oil in a mixing bowl. Cut coconut oil into flour with a pastry cutter or fork until coconut oil is the size of peas or smaller. Lightly stir in acid of choice and milk. Cover and leave on the counter for 8 hours or overnight. The next day, preheat oven to 450 degrees Fahrenheit. Gently mix in honey, cinnamon, baking soda, baking powder, and salt. Finally, work in raisins. Will you try these cinnamon honey spelt biscuits? .-= Mindy´s last blog post… overheard =-. .-= Melissa´s last blog post… The Hen House =-. I made these last Sunday for my Sunday School breakfast. They were a huge hit! I made them with fresh ground whole wheat flour and coconut milk. .-= Hallee the Homemaker´s last blog post… Beef Bacon Quiche Tarts =-. Hi, I am new to all of this and am radically changing but on a steep learning curve. 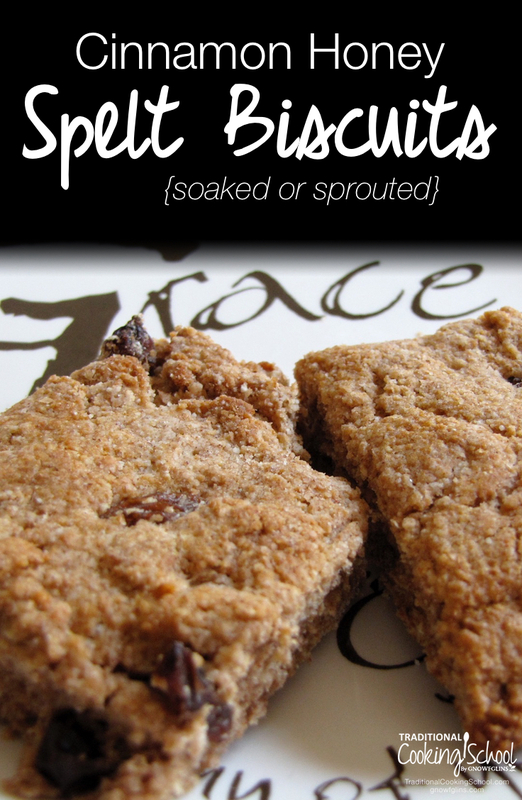 I have bought 4 day sprouted spelt and just made these and they were great. So thank you for that. I am just curious about the soaked version, you are soaking to achieve what. To ferment the whole spelt. What is happening to it …..you can get technical , so I can understand. The sprouted spelt is quite expensive so thats why I am wondering about getting the spelt as it is and then soaking as you suggest. Thanks and sorry I am a complete novice. These sound yummy! I love using whole foods, so this will be a great recipe to try. BTW, I also love your plate/serving dish. It looks like it might be from the Dayspring line? Do you mind sharing the info on it? It’s beautiful! Hi Wardeh! I am glad to find this recipe. I just listened to your recent podcast and started looking for something I could make with spelt flour that doesn’t have milk – we are out of milk. I am wondering I can use some lard in place of a couple of tablespoons of coconut oil? but I just want to make sure that is okay for this recipe. I made these this morning after soaking the spelt flour overnight; I substituted two of the TB of coconut oil with leaf lard and added a touch of vanilla extract to the final ingredients. These were outstanding! I used soaked/sprouted dehydrated Einkorn flour and used water to mix them, no other changes were made. Definitely a keeper recipe. Thank you so much for sharing. They really were delicious and tender. I just made these and they are wonderful. I wonder though how to best store them. Do they freeze well? I have frozen them. I find it best to wrap each one individually and freeze then freeze in a container altogether. This makes it easy to pull out just one or two and helps prevent freezer burn.